Finally had a chance to visit the site of the 9/11 memorial at the World Trade Center this month. We have been blessed with a lot of really beautiful, strong memorials in recent years, from the Vietnam Veterans' Memorial in Washington, DC, to the Oklahoma City memorial with its empty chairs, to the FDR Memorial, again in DC. There have been only a few stinkers (the World War II memorial and, to a lesser degree, the MLK memorial, both on the National Mall). 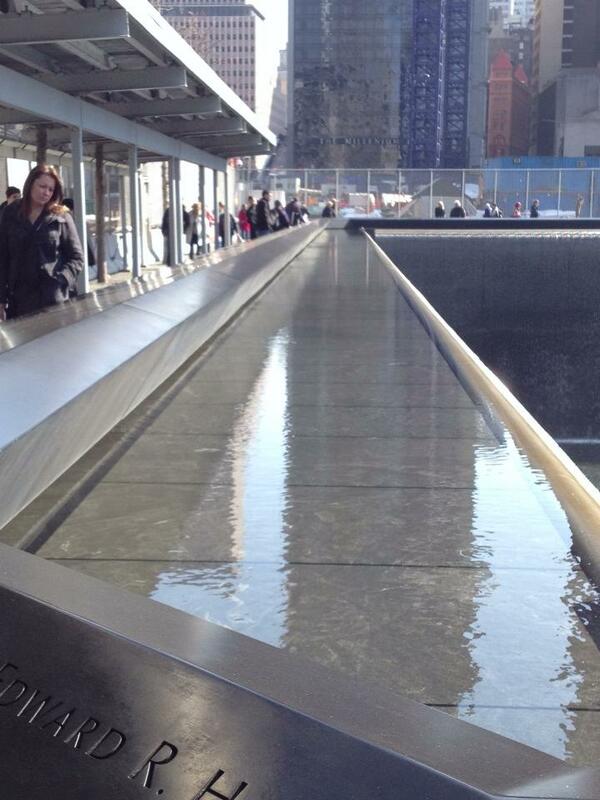 The 9/11 memorial consists of two pools situated on the footprints of the twin towers. Names of the lost are inscribed on a metal counter that goes around them. 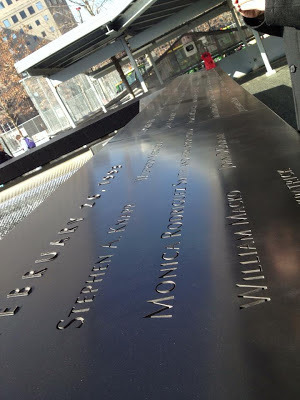 They include not only the names of the 9/11 victims but also those of the earlier 1993 attack. In cases where a victim was pregnant, "and her unborn child" is included. From under these counters, water falls in thick sheaths down to a pool the same size as the tower, gathers at the bottom, and then falls further into a small dark rectangle whose bottom is not visible. In this elegant design are intimations of tears, falling, disappearance. I so admire that dark rectangle in the middle of each pool because it is terribly sad, it's allowed to be terribly sad. 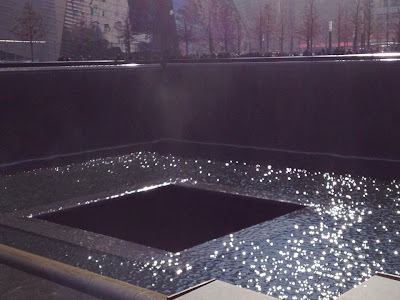 The water not only reminds us of tears and falling but also creates a soundscape that isolates the memorial from the quotidian noises of the city: construction, car horns, and the like. It helps create a sacred space that is graced with the so-called Survivor Tree, the one tree at the World Trade Center that survived the attack.